Visiting The Library. Why It's Important For Kids & Even Babies! It's a great idea to start visiting the library with your baby early on in his or her life. 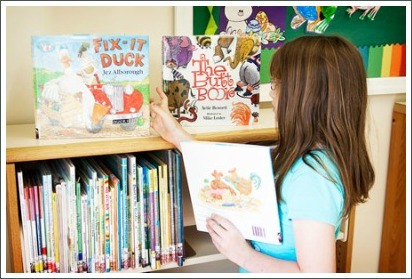 Kids love and thrive on routine and if you do this, the library will quickly become a familiar and fun place to be. Visiting the library is also be a great weekly activity if you're a stay-at-home parent. Most libraries have storytime once a week during the school term, sometimes with a craft activity afterwards, and kids usually love this. Planning for a regular, one-on-one trip to the library can be a good opportunity to spend some time with each of your children. My husband and I found this worked really well with our three children as they got older and one-on-one time became a rarity. In Australia, each local council area operates at least one public library which is free to use if you live in the area. Anyone can walk in off the street, sit for a while and read the books and magazines but if you'd like to borrow a book to take home you'll need a library card. Happily, getting your hands on your very own library card is usually pretty straightforward. You'll have to fill in a form, then take it to a staff member at the desk where you'll be asked to show a couple of forms of identification which have your address on them. Your card will usually be given to you on the spot so you can start borrowing immediately. These tips are not rocket-science, I know, but sometimes it's easy to overlook the obvious. get your child his own library card, even if he's still a baby or toddler. let your child choose his own books as soon as he's able to point at or grasp a book. Of course you can guide him and choose some suitable books yourself if necessary but let him choose some too, even if they're totally un-suitable! sit your baby or young child up on the counter so he can see what's going on when you borrow his books. Give him the library card and show him how to hand it over to the librarian. He'll love watching what the librarian does and then receiving the books and card back to take home. Little kids love playing a part in this fascinating process and getting them involved makes visiting the library more fun for both of you. Encouraging them to get involved like this also helps to get them interested in books and reading which is important if you're keen to raise a reader. By explaining how the library works, you're also helping your children to understand a little more about how the world works. Teachers call this building background knowledge. If you have little ones who can't yet read, building background knowledge is an important pre-reading activity. If you have an older child who is learning to read or who can already read independently, building background knowledge will help him become a fluent and capable reader who enjoys reading.